Chekhov plus Soulpepper plus director László Marton equals great theatre. 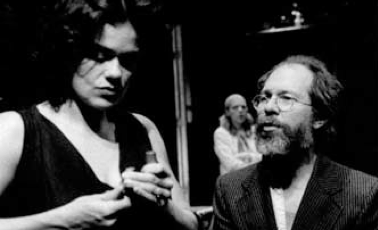 With “Platonov” in 1999 and 2000, adapters Susan Coyne and Marton had to shape a coherent play from the raw material of a rambling unperformable work. With “Uncle Vanya” in John Murrell’s crisp translation, the company begins with a masterpiece of world theatre and makes it seem brand new. As with “Platonov”, Marton draws incredibly detailed performances from the entire cast, performances so natural they seem improvised. With the characters and their situations brought so fully to life, this now becomes the best production of this play I have seen. We are subtly drawn into the world of the play long before it begins with the distant booms of Richard Feren’s soundscape coming ever closer until the translucent plastic curtain before us streams with rain. The curtain rolls upward to reveal a floor of overlapping carpets to a wall-less room furnished, it seems, from a junk shop and surrounded with a border of real mud. Ensconced within Michael Levine’s set are four people, our title character completely covered with a sheet, as if they were also so much detritus. Unlike previous productions that misguidedly try to add glamour or nostalgia to life in the country in 19th-century Russia, Marton and his design team have emphasized Vanya's and his niece Sonya’s poverty. Allusions to this abound especially in the explosive third act, but this is the first time I’ve seen a director take them seriously. Vanya and Sonya have scrimped for 20 years so that Vanya’s brother-in-law Serebriakov could go to university and have the leisure to write articles. To highlight the waste of this financial sacrifice, Michael Levine gives Serebriakov and his second wife Elena stylish new clothing while the entire rest of the cast look as if they’ve lived in the same clothes for years. The central room of the house is lit by a single bare light bulb that has to be moved from lamp to lamp. When the electricity fails in Act 2, Kevin Lamotte gives us the highly realistic effect of how dark a room would be if lit by only two candles. This physical darkness underscores the metaphor various characters use about their lives: a glimmer of light far off gives one the courage to go on despite pain and suffering. For the visiting Dr. Astrov and, tragically, also for Vanya, this light is Serebriakov's wife Elena. For Sonya it is the idealistic Astrov. For the whole family it was Serebriakov, who has proved not to be the brilliant man they had supposed. For Vanya's mother it is her political pamphlets; for the aged servant Marina her religion. After the hopes of each have been dashed, Sonya's final speech about the rest they will find in the next life shows that she and Vanya, like the elderly around them, have already given up on hope in this life. The cast shows us ensemble acting at its finest, each actor equally strong so that the multiple links among them become apparent. Diego Matamoros gives a heartbreaking performance as Vanya. He makes Vanya seem a kind of derelict in his own house. He shows more clearly than I've ever seen how the death of Vanya's sister has contributed to his meditation on his lost youth and wasted life. Matamoros fully captures Vanya's mixture of self-loathing, rage, despair, clownishness and hopeless love. This is the most impressive male performance I've seen all year and its completeness makes the previous Vanyas I've seen look like unfinished sketches. Liisa Repo-Martell gives an equally rich performance as Sonya, shy, convinced of her plainness, giddy in love, crushed that it is unrequited, seeking solace as she always has in work. Albert Schultz is excellent as Dr. Astrov, who knows his plans for conservation and reforestation are only a way of making up for the lack of love in his life. Kristen Thomson succeeds in the difficult task of garnering some sympathy for the bored, indolent Elena, who nevertheless ruefully recognizes that by marrying Serebriakov she has thrown away her youth. As Serebriakov, Robert Haley is every bit as infuriating as a weak, narrow-minded, hypochondriac academic can be who repays all the coddling he receives with complaint. The rest of the characters have all resigned themselves to their fates in a way that the other characters hope, vainly, never to do. Joyce Campion (Marina) is as delightful as ever as the old servant whose religion makes her see all human beings as fools in God's eyes and whose contented knitting counterpoints the agonies of the others. Michael Simpson (Telyegin, known as "Waffles") plays Vanya's tenant who comically but realistically has resigned himself to the curse of his homeliness. Charmion King (Maria Voinitsky, Vanya's mother) is imperious in presence but is foolish and cruel enough to think more highly of her son-in-law than of her own son. And roaming the stage is William Webster (Yefim), a bent-over servant seemingly beneath the others' consideration. Marton has focussed this production on the mental strategies the characters use for survival. The mud, the storm, the rain only reinforce the tenuousness of man's life on earth and the need for spiritual as well as physical shelter. This is a bleaker interpretation than usual but one that rings truer and clarifies more aspects of the play than any other I've seen. All those involved in the directionless "Seagull" now playing in Stratford should be bused in for an object lesson in how Chekhov should be performed. If "La Ronde" was a misfire, this "Uncle Vanya" proves yet again that Soulpepper can also achieve greatness. Photo: Kristen Thomson and Diego Matamoros (foreground) with Liisa Repo-Martell (background). ©2001 Soulpepper Theatre Company.